Industrial Air Filtration Market size is set to surpass USD 6.5 billion by 2024; according to a new research report by Global Market Insights, Inc. Global industrial air filtration market is growing due to various factors such as environmental awareness, rapid industrialization and efficient production and energy efficiency. This technology assists in improving overall system reliability along with saving energy. However lower sales of these equipment due to recent economic recession in regions like Europe has led to limiting growth of global market. Stringent occupational safety policies & norms defining the quality of air inside commercial and industrial facilities have led to the evolution of the market. Rising concern towards mitigating harmful impacts of air pollutants commonly found in industrial facilities ensuring healthy working condition should accelerate demand for industrial air filtration market size. Enforcement of stringent regulations in Europe and the incorporation of Integrated Pollution Prevention and Control Directive coupled with new strict laws are expected to drive the demand for this market over the forecast time frame. Increasing spending on R&D investments and Foreign Direct Investments (FDI) by various companies in Europe are also expected to fuel the growth of the market. 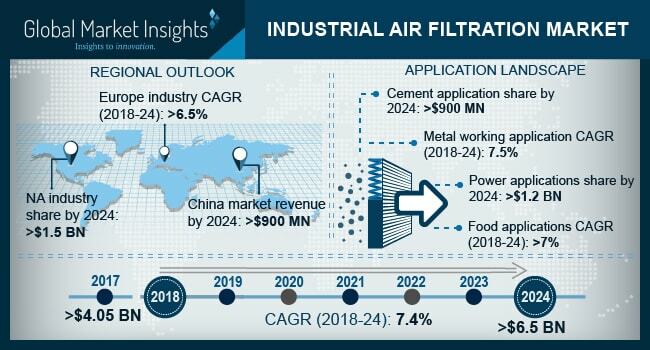 China industrial air filtration market size is expected to reach over USD 900 million by 2024 owing to the increasing demand in various end-use sectors such as food & beverage, metal manufacturing, and pharmaceutical industries. Economic developments in this region will further increase the demand for sophisticated air filtration solutions. Mist collectors market is expected to grow over 7% during the forecast timeframe. It can be credited to its compliance with indoor air quality standards and clean air benefits reducing the adverse effects of exposure to metalworking, reduced housekeeping & maintenance costs, and improved part quality. The adoption of mist collectors in the food processing industry is anticipated to rise rapidly as they are used in the removal of oil mist, fumes, steam, and coolant mist from food & beverage manufacturing processes. Industrial air filtration market from food applications is projected to grow with a growth rate over 7% during the forecast timeframe. Food processing industry requires compressed air to preserve food. Therefore, there is a need for clean and purified compressed air, where it is strictly monitored for safety and hygiene of the products and users. Baghouse filters market size is projected to reach over USD 1 billion by the end of 2024. These are used in varied sectors from household to industrial applications such as cement, food and coal-powered plants. They are efficient and can be used for rugged applications, but they need high maintenance and require a dry environment for their operation. Their usage can be limited to certain chemicals and operating conditions. Germany industrial air filtration market size is expected to reach over USD 390 million by 2024 owing to the rapid product acceptance in the application sectors such as food & beverages and manufacturing. The enforcement of stringent regulations and directives is expected to further fuel the demand for this region. Andrew Industries, BWF Protec, Absolent Group, Camfil Group, AAF, and Cummins, Inc. are key players in industrial air filtration market. Strong R&D spending by manufacturers in order to comply with various environmental regulations may improve and expand product ranges thereby stimulating industry growth.